The following explains the descriptions of the track header and the types of tracks. You can make settings for each track simply on the track header, for example, to lock the track for preventing placed clips from moving or to set the track to exclusively play back audio. You can set the following items in the track header. 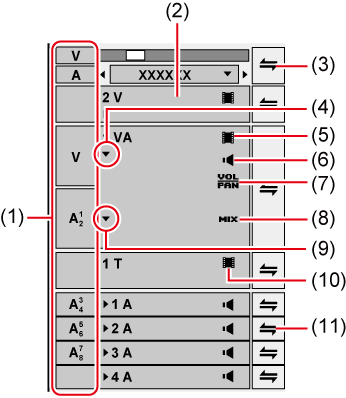 When a clip is displayed on the Player or a clip is selected in the bin, the channel held by that clip (source channel) is displayed on the track patch. When a clip in the source browser is selected, the source channel is displayed on the track patch according to the channel map in the project settings. Also, the track patch position displays which track the source channel is mapped to when a clip is placed on the timeline by a shortcut key or button. The source channel mapping to each track can be changed. Click this to switch the select/deselect setting for the track. Click this to set sync-lock for all tracks on and off. Right-click to lock the selected track. Click this button to display the rubber band for the audio. When mute is set, the video part of the track is not played back. The video part and mixer area of the clip on a muted track is displayed in gray. When mute is set, the audio part of that track is muted. The audio part and volume/pan part of the clip on a muted track is displayed in gray. Switch between the volume adjustment mode and the pan adjustment mode. Switch the transparency adjustment mode on/off. Click this button to display the rubber band for the transparency. Switch the show/hide setting for the title. The title is not played back when it is set as hidden. Click this to set sync-lock for a specific track on and off. Shortcut key operations are enabled on the selected track. Place video, still image, title, color bar, and color matte clip on this track. Video clips with audio are placed as video clips with the audio part disabled. Place video, audio, still image, title, color bar, and color matte clip on this track. Place video, still image, title, color bar, and color matte clip on this track. 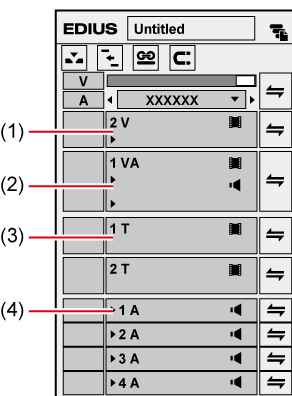 Display priority is given to clips placed on the T track over V/VA tracks. Video clips with audio are placed as video clips with the audio part disabled. Place audio clip. Video clips with audio are placed as audio clips with the video part disabled.